Financial services firm is already raising payout one year after initiating dividend policy. Financial services specialist CNO Financial (NYSE:HNI) announced yesterday that, along with re-electing its board members, ratifying its public accountants, and approving a non-binding say-on-pay proposal, shareholders also got a dividend increase for their efforts. The board of directors said the new quarterly dividend is payable on June 24 to the holders of record at the close of business on June 10, and represents a 50% increase from the $0.02 per share it was paying previously. 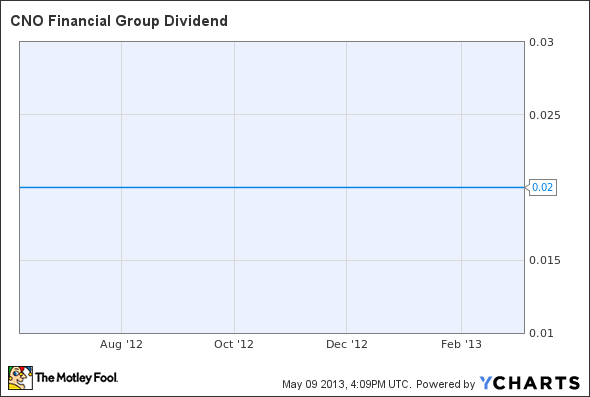 CNO only initiated its dividend policy in May of 2012. CNO Financial CEO Ed Bonach said: "Increasing the dividend demonstrates continued confidence in our current and future financial strength." The regular dividend payment equates to a $0.12-per-share annual dividend yielding 1% based on the closing price of CNO Financial's stock on May 8. Should You Buy and Hold MetLife?